This days I was installing one Exchange 2007 server into existing Exchange organization (two other Exchange 2007 servers). 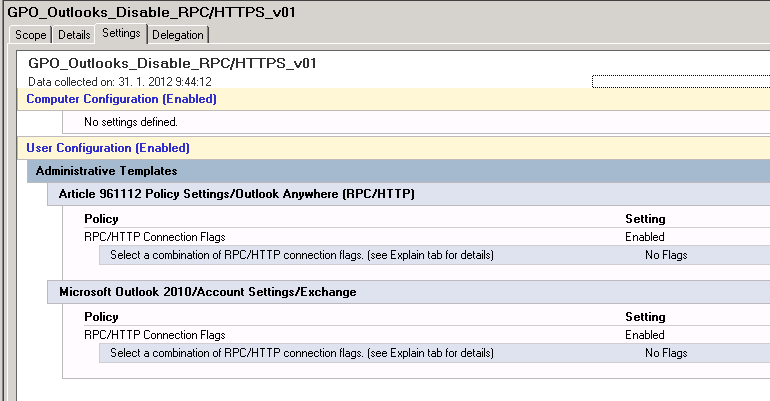 I enabled one new server all features which Exchange 2007 brings to clients: Outlook Anywhere, Autodiscover, ActiveSync. After couple days we discovered that by this setting not only local users were affected, but all clients connecting into Exchange Organization (also those connecting to two old servers). Exchange Autodiscover pushed OutlookAnywhere settings into all clients connecting into Exchange Organization. And that was a problem. When Outlook clients, which were connecting to those two old servers, were disconnected from local LAN or VPN connection, they tried to connect with its settings, which was not wanted. I cleaned up ExternalUrl properties for features, but Outlook clients haven’t change their settings for OutlookAnywhere. I was expecting to clean all settings up. Nothing happened 🙂 Thank you Microsoft.